FOR THOSE WITHOUT HEARTS....LOVE IS A WASTE OF TIME. THE MOST DEVASTATING TIME OF YOUR LIFE...IS WHEN YOU REALIZE THAT THE CHILDREN YOU LOVED FROM CONCEPTION...NEVER LOVED YOU. JUST BECAUSE YOU LOVE ANOTHER PERSON...DOESN'T MEAN THAT PERSON IS CAPABLE OF LOVING YOU BACK. IT'S TAKEN YEARS BUT I KNOW--FOR CERTAIN--THAT THOSE WITHOUT HEARTS CAN PRODUCE CHILDREN WITH THE SAME "HEARTLESSNESS." I NEVER WOULD HAVE BELIEVED IT POSSIBLE EXCEPT....I'VE LIVED IT. I WRITE ABOUT THE SUBJECT BECAUSE I KNOW THERE ARE MANY OF YOU WHO KNOW WHAT I'M TALKING ABOUT; THAT THERE ARE MORE THAN A FEW OF YOU WHO, LIKE ME, HAVE BEEN ABANDONED....THROWN IN THE TRASH--LIKE GARBAGE-- BECAUSE WE NEVER "MEASURED UP" TO THE SKY-HIGH STANDARDS SET BY OUR CHILDREN. FOR THOSE WITHOUT HEARTS...LOVE IS A WASTE OF TIME. Instead of returning to California after her Father’s Funeral in December of 2010, my youngest daughter, Rosemond, quite handy with a computer, remained in Pine Bluff to help stepmother secure more of Jack’s earnings from online sites like: The Veterans Administration, Social Security, Banks, Insurance Policies, Investments, etc. One day, Rosemond called my home phone to give me a “piece of her mind.” She expressed her irritation with me, her outrage that only one day after her Daddy’s death, I was online with the Social Security office. This is the same child who, in 1987, rode the train from NY City to Erie, Pennsylvania (I paid for the ticket), to spend Thanksgiving with me. Along the way, the train crew experienced some weather-induced track problems and once they reached Buffalo, NY, made the decision to end the trip at Buffalo. Like Rosemond, many of the passengers were students going home for the holidays and the majority had tickets to Erie. She called me from Buffalo (collect of course, this was before cell phones) to tell me the bad news. She said " I’ll be waiting for you inside the Buffalo train depot. Just hurry because it's crowded, cold, and I'm sick." I told her to let me see what I could do and, always the dramatic pessimist, Rosemond said “Mother you can’t do anything! Just get in the car and drive to Buffalo to pick me up.” The Snow was waist deep in all directions. Most of the roads and highways in and out of Erie were closed. Trying to remain calm, I told Rosemond to call me back in 15 minutes, then hung up. Thinking creatively……..I decided to test my “power of persuasion”. Knowing that bad weather can often create slow-news-days, I called Buffalo’s ABC television station and asked for the News Desk. 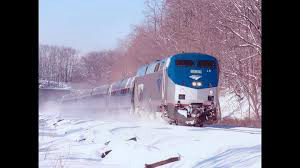 Introducing myself as a former ABC show host from Little Rock, AR, I detailed a potential story: "Many train passengers are stranded in Buffalo, NY, and won’t be with family for the holidays. Sadly, most are college students who live in Erie, PA. I touched on the dictatorial manner used by the train crew when announcing their decision to end the train trip in Buffalo. I explained that my daughter was a passenger on the train and she was sick. An acting student from NYC, my daughter was headed to my house in Erie, PA, for a much-needed rest, good food, and TLC." The TV Producer asked her name, stating that the camera crew would need a contact person among the passengers. Soon, the TV crew arrived at the Buffalo Train Station and, with cameras’ rolling, began interviewing the very-emotional passengers. I watched the TV News and, within twenty minutes, a railroad representative spoke to the TV Cameras, announcing that the railroad officials had reversed their earlier decision. The train to Erie, Pennsylvania would be “back on track” in thirty minutes. It wasn’t long before I received a call from Rosemond, telling me what time to meet the train in Erie. Before hanging up, she scolded me for calling the TV station and “pressuring” the film crew to interview her. She was embarrassed… truly horrified to learn… HER MOTHER had used such “drastic measures”. My reply: “The train is on track and ready to roll, right? I bet the other passengers would be happy to claim me as THEIR MOTHER. "